Place unlimited ads up for a month on Cheaplandinamerica.com for only $49.95. Trying to sell land? 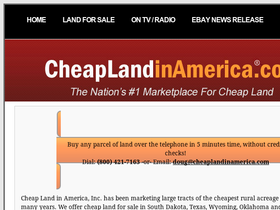 Place an ad on Cheaplandinamerica.com today for only $19.95 for the month. Click here for details. Check out Cheaplandinamerica.com for land lots as low as $200 or less per acre. Sellers act now to take advantage of the easy financing and no credit checks with Cheaplandinamerica.com.